Caustics can be described as the light pattern you see at the bottom of a pool on a sunny day. Caustics Generator is a software application that will let you render such caustics light patterns. The rendered images are ideal for use in real-time graphics such as games and simulations, but can also be used for architectural renderings, film rendering and advertisement renderings where water needs to be illustrated. The Caustics Generator software is industry proven since over 15 years and has been included in the production tools of major studios in the animation and gaming industry. It is also very popular among the architecture firms as a way to improve still image renderings. The Caustics Generator software is available for both Windows, Mac and Linux, but the Linux version has no graphical user interface. All versions comes with a command line tool that can be integrated into existing production pipelines. Linux command line executable for scripting or integration into other tools. This version does not include a GUI. Caustics Generator is available in five versions. The free version can be downloaded below and is free for non-commercial use. There are also four commercial versions available that are aimed for the professional users. See product feature chart below for a comparison between the versions. Besides the caustics pattern, in Caustics Generator Pro you can also output the water surface as a height map and normal map. While the caustics images are good for lighting, the height map can be used for modelling the water surface and the normal map can be used for surface reflection and refraction effects. 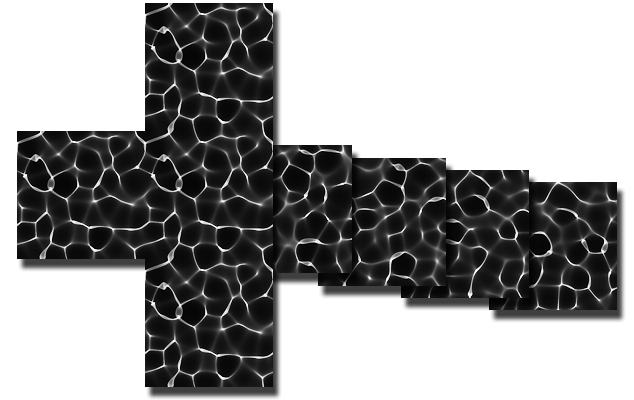 All textures are tileable and loopable in time. Click on images for a tiled example. Click on image to view an animation sequence of a looping caustics rendering. This example uses 60 frames of rendering at 30 fps playback that is looped five times to create a 10 second animation. 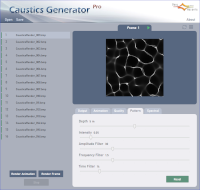 The Caustics Generator user interface on Windows and Mac allows you to play with the parameters that form the caustic pattern. If you turn on Auto Render, the image is updated live while you change the sliders. 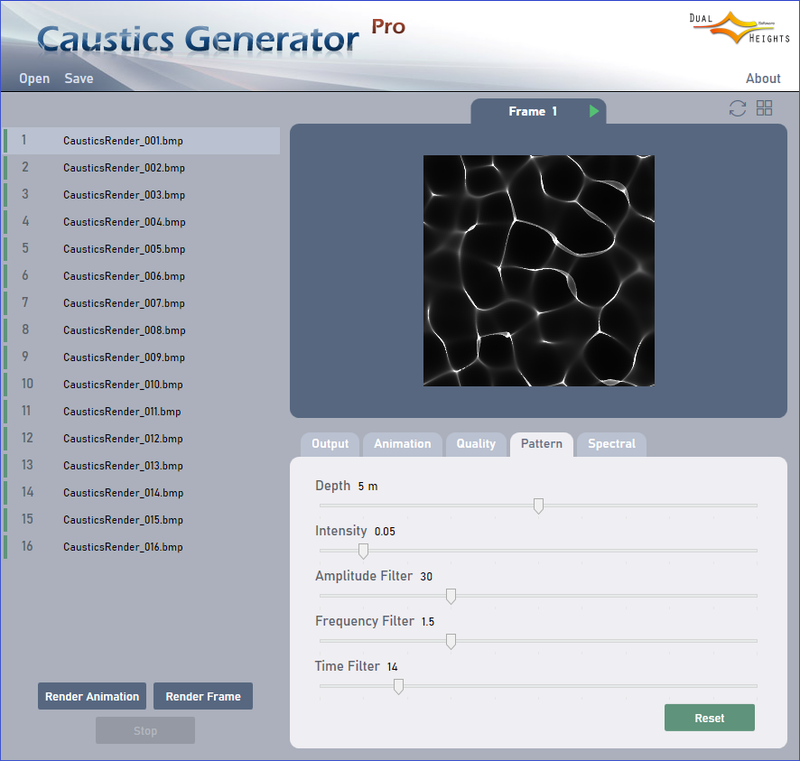 In Caustics Generator Pro you can also render and preview the animation directly in the user interface. You can download caustics generator free of charge from here. The program can be freely used for non-commercial purposes.